I recommend this as being a good read – recommended for those looking for an intelligent insight into this whole strange event. Trouble is that that those who read this will probably already know that the Pauline Hanson thing is a scam. They already know that she has not changed as a a person or in her fringe pretend policies (compliment to even use the word policies). People who read this already know that she has learnt to play the system better – she knows more about how to play the election game or how to get others to do it on her behalf (eg in WA elections) in order to increase the amount of money she earns from election. 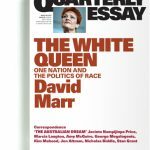 David Marr estimates her winnings now total about $7,000,000 since she started this gaming of the electoral systems. But it is a good read and he presents loads of facts/stats to back up his views on Hanson.